October 25, 2011 - Composite materials are made by combining materials such as carbon fibers with epoxy, they have been used in airplane components for decades. Although composites are lighter and stronger than most metals, their increasing use in commercial airplane structures such as the fuselage and wings has raised safety concerns. The Boeing's 787 is the first mostly composite large commercial transport airplane to undergo the certification process. The Federal Aviation Administration (FAA) and the European Aviation Safety Agency (EASA) certify new airplane designs and evaluate the airworthiness of novel features--like composite structures--against existing safety standards, which are often based on the performance of metallic airplanes. 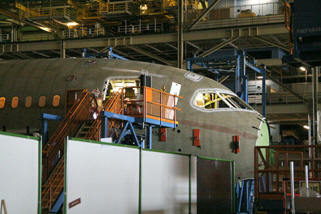 In August 2011, FAA and EASA certified the Boeing 787, which is expected to enter commercial service in the fall of 2011. U.S. Government Accountability Office (GAO) which is an independent, nonpartisan agency that works for Congress, often called the "congressional watchdog," was asked to review FAA's and EASA's certification processes and FAA's oversight of the composite airplanes once they enter service. The GAO examined how FAA and EASA assessed the use of composite materials in the Boeing 787 fuselage and wings, and the extent to which FAA has addressed safety-related concerns associated with the repair and maintenance of composite airplanes. The GAO reviewed certification documentation, conducted a literature search, discussed repair and maintenance issues with experts, and interviewed FAA and EASA officials and Boeing representatives. The FAA, EASA, Boeing, and others provided technical comments, which the GAO found that FAA followed its certification process in assessing the Boeing 787 airplane's composite fuselage and wings against applicable FAA airworthiness standards. The FAA applied five special conditions when it found that its airworthiness standards were not adequate to ensure that the composite structures would comply with existing safety levels. These special conditions require Boeing to take additional steps to demonstrate the 787's structures meet current performance standards. The FAA also granted Boeing an equivalent level of safety finding when the manufacturer determined it could meet the standard but prove it differently from the method specified in that standard. On the basis of a review of the FAA's special condition requirements, Boeing submissions, and discussions with the FAA and Boeing officials the GAO found that FAA followed its process by documenting the technical issues related to the design of the composite fuselage and wings, determining the special conditions and equivalent level of safety finding, obtaining public comments on draft special conditions, and monitoring Boeing's compliance with those conditions. EASA also assessed the use of composite materials in the Boeing 787 and relied on FAA to oversee Boeing's compliance in some cases. EASA's process for determining whether its existing airworthiness standards were adequate to ensure the 787's composite fuselage and wings met current levels of safety was similar to the FAA's special conditions process and resulted in some additional review items, partly because of differences in their respective standards. On the basis of expert interviews and a review of literature, the GAO identified four key safety-related concerns with the repair and maintenance of composites in commercial airplanes. (1) Limited information on the behavior of airplane composite structures. (2) Technical issues related to the unique properties of composite materials. (3) Standardization of repair materials and techniques. None of the experts believed these concerns posed extraordinary safety risks or were insurmountable. The FAA is taking action to help address these concerns identified by the GAO related to the repair and maintenance of composite airplane structures. However, until these composite airplanes enter service, it is unclear if these actions will be sufficient.